Former Tanzanian beauty queen, Jokate Mwegelo, has unveiled Kidoti Brand, a fashion and hair style label that will be involved in both fashion show and hairstyles. 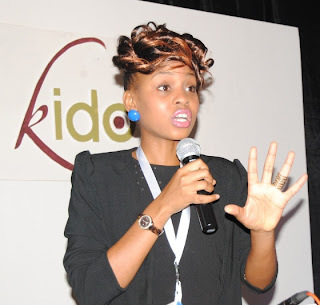 Jakote, who was the first runner-up at Miss Tanzania 2006 competition, said the Kidoti brand is a reflection of her own image and personality. The label, she said is an authentic Tanzanian lifestyle brand founded in 2011. Jokate asserts that her creation is inspired by a unique blend of African traditional costumes and modern outfits of both sexes. The Kidoti brand carries the tagline “Define Your Beauty”. “I am pleased by the impact of the fashion brand that now tries to penetrate the Tanzanian market,” she said. The beauty model expressed confidence on her newly introduced brand. “I am sure I will reach my target and dominate the industry. My brand’s vision is to transform the fashion industry. The brand will carry an array of products including the synthetic hair extensions, a clothing line, fashion accessories and cosmetics,” she said. Jokate showcased her first creations at the Red Ribbon Fashion show, which was organised by Tanzania Mitindo House in December 1, last year; to ascertain the strength of the brand. “I was very impressed due to the fact that my design thrilled many fashion show stakeholders,” she said. Great blog, love your unique style.